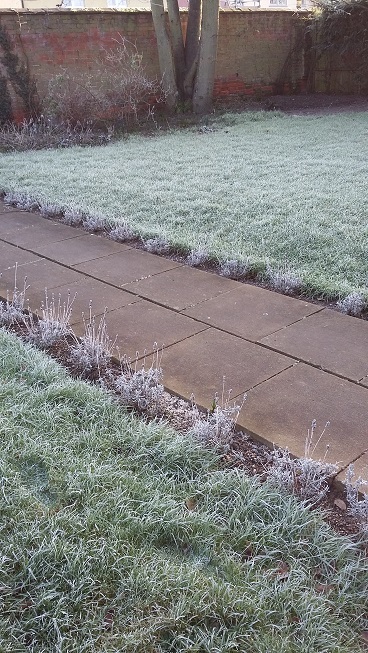 We woke up this morning to discover the first fierce frost of the year. 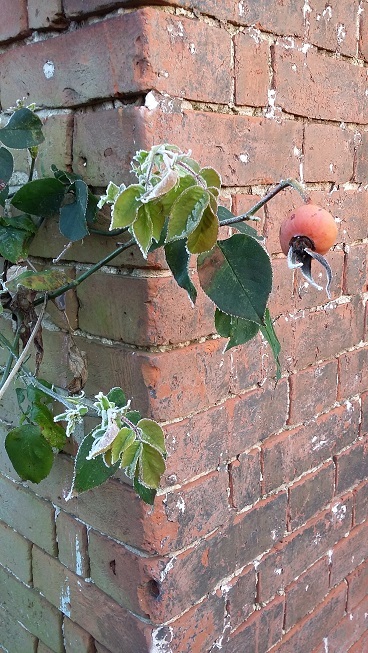 Thus far we’ve escaped any snow, but today the frost had left the garden looking magical. 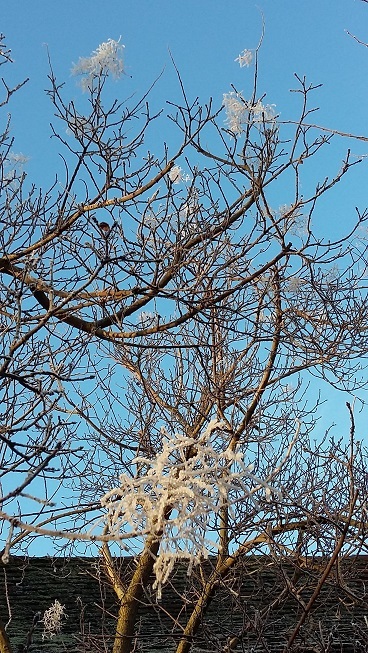 Every twig and leaf is sparkling with ice crystals. The lawn looks like it has been dusted with icing sugar, and even the spider’s web on the garden door is outlined with ice. The children experimented with huffing like steam trains as they ran ahead to school, delighted to see their breath white against the cold air. I was glad to be bundled up in a fleece, big coat, scarf and my new gloves. Despite the cold, I couldn’t resist taking some photos. Much of our garden is quite sheltered, thanks to the boundary wall, but the back of the house takes the brunt of the wind and weather rushing up the hill. 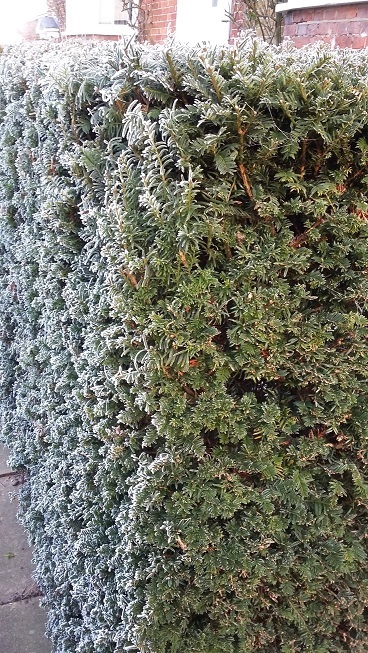 Frost on one of the yew hedges showed how one side was frozen, whereas the other side was left almost untouched. Now you see it, now you don’t – only frost on the front of the yew hedge. 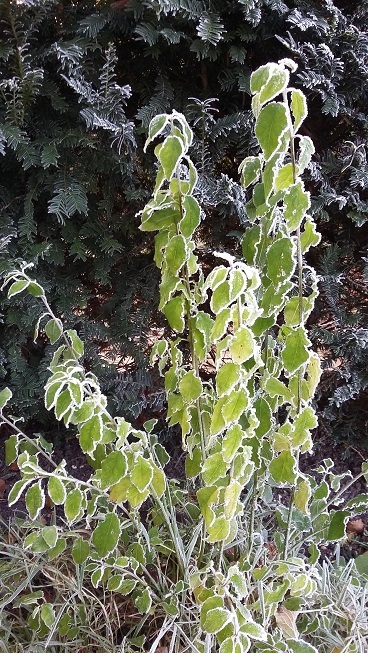 I love how the frost outlines every leaf. I’m even happier when I can huddle inside, looking at the view, rather than lingering longer in sub-zero temperatures! Every leaf, every blade of grass, outlined by the frost. Everyone seems to be posting frost pix at the moment – are we, here in Torbay, the only place in the country without frost, I wonder? But super pix!